Enjoy a sun filled holiday in Side by booking your stay at the comfortable and friendly Sueno Hotels Beach Side. 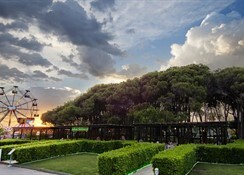 The Sueno Hotels Beach Side is perfectly situated on the beachfront surrounded by the lovely wooded area of Sorgun in the historic town of Side. This modern hotel is great for couples and families looking for an affordable holiday with an Ulta All-Inclusive concept and plenty of rest and relaxation along with countless activities and attractions. A total of 760 rooms are situated in a main building and several Lake Houses, and a winning combination of luxury and extreme comfort provide accommodation to suit the most exacting tastes. The town center of Manavgat is only 5 km away and there is a wide array of historical sites nearby, but with all the facilities and the warm hospitality at the hotel, you may never want to leave! For an affordable holiday in Side, the Sueno Hotels Beach Side is right on target. 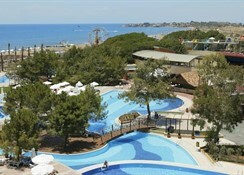 Antalya International Airport is 60 km from the hotel. Please Note – Rates are not valid for Russian, German, Romanian or Austrian passport holders. The facilities at the Sueno Hotels Beach Side offer beautifully maintained gardens and comfortable accommodation for a peaceful holiday. Food, drink and entertainment: THIRTEEN bars, snack bar, terrace, disco, main restaurant and FIVE a la carte restaurants provide for dining and drinks. There are organised activities, a mini club for kids, and a stage for shows. There are also Turkish nights, folk dances and belly dance shows on certain days of the week. 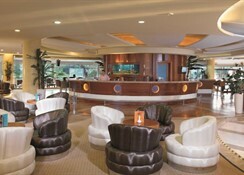 The all inclusive system includes local alcoholic and non-alcoholic drinks. Imported drinks and cocktails are available with extra payment. All inclusive service is provided between 10:00 and 24:00. After midnight drinks are available from the bars with extra payment. 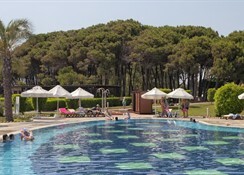 Sports, games and activities: Six outdoor pools, indoor pool, direct access to the beach, sun beds, umbrellas, deck chairs, towels at the beach, drinks throughout the day, free of charge, kids club with childrens pool with kids slide, childrens playground, garden, gym, Spa and Wellness Centre with countless treatments, massage, Sauna, steam bath, TV lounge, games room, four outdoor tennis courts, squash court, Luna Park with all sorts of rides. Additional: 24-hour reception and check-out service, entry hall and lobby, currency exchange facilities, lift access, newspaper stand, market, hairdressing salon, room service, photographer, shops on site, full functional conference facilities, Internet access (fees apply), wheelchair accessible, car rental, car park and garage. A laundry service is provided for an additional fee. The Sueno Hotels Beach Side features a main building with 606 hotel rooms (90 Junior suites, 1 king suite, 12 family rooms, 495 standard rooms, 8 handicapped rooms). The lake houses feature 154 rooms (20 family rooms and 134 standard rooms). Sea, pool, garden, and historical views are available. All rooms contain direct dial telephone, music, carpet, ceramic, balcony, mini bar, safe box, internet connection in some rooms, Satellite TV, central air conditioning, private bathroom with bathtub and hair dryer.